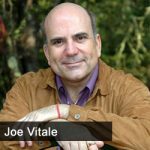 Dr. Vitale believes when you learn to get clean with money and stop self sabotaging your financial future you will start to attract more money to you. You must first get through the filters that are your beliefs and see what is really possible to know you are deserving of living a wealthy life. When you want something and have the means to obtain it you should buy it to reinforce an unconscious belief of worthiness. And, always give back a portion of your good fortune to create a bond of trust in the universe. Change Your Mind, Build More Wealth?